The Stars and Afterward (63'20") may at first seem like an album of charged sequencer music, but further into this release we also discover a variety of interesting modes, zones and atmospheres. Here Phillip Wilkerson finds powerful common ground between vintage influences and modern production, neither chasing trends nor making a fetish of retro sounds. He deals in unforced tones that exert their own freedom. Overtly synthetic The Stars and Afterward provides a sense of propulsion in its motor-like patterns of notes. Within the unrelenting procession of evenly spaced beats may be felt a forward momentum. 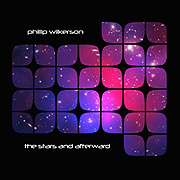 The light skipping rhythmic accents, synchronized to a composed bassline, provide a perfect foundation over which Wilkerson adds keyboard lead lines both thick and thin. This CD also features realizations that ask for roaming engagement. At times pastoral and silvery then dark and dense, these slowly shifting ambient realizations open up space then fill it with sound. Once people hear this music they align with it - as its deep sonic pleasures lead to reassuring calm. Aging in place, mainstream music feels like something important is over. Thankfully, Electronic Music and all of its offshoots continue to expand in surprising and creative directions - leading the listener into new and imaginative realms.